The LogPlot Data Editor displays different blocks of data (lithology descriptions, curve listings, etc.) in tabbed data “pages” where you can type, point-and-click, cut-and-paste, or import the information. 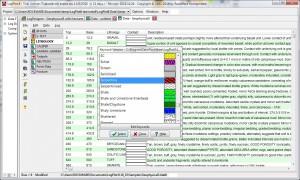 The Project Manager allows for easy access to LDAT8 files, and also directly opens data stored in a RockWorks database. Point-and-click selection of rock or soil types. 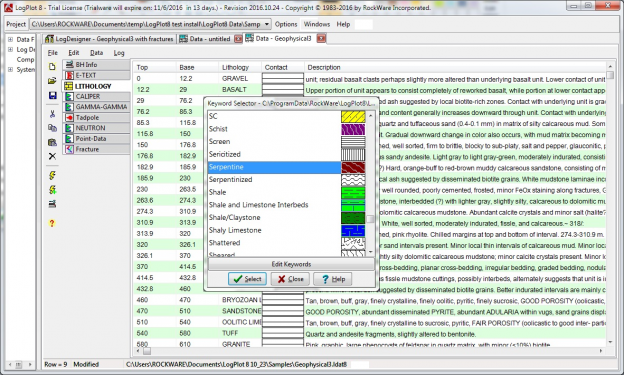 Use the built-in libraries of keywords and patterns, or create your own. You can maintain different libraries for different projects.